You love the natural light & venting that windows provide, but you hate the potential lack of privacy. You cannot have the solitude of this sacred place compromised. What can you do? We’ve all been there – that awkward moment when you use a certain bathroom for the first time, only to find a most unfavorable placement correlation between the toilet and window. You’re further distressed to see the window open. What’s this, no curtains or blinds?! You won’t be in a rush to use the facilities here again. And that is exactly what you don’t want for your own home. You want your guests to be comfortable. Problem is, you have a similarly unfortunate layout where a peek in the window could result in seeing something one shouldn’t. Well, the good news is you can avoid such trauma. 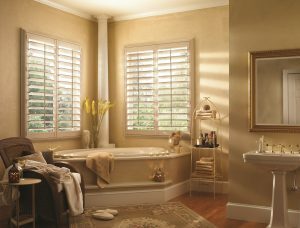 You can have an open window that takes advantage of air circulation and natural light without compromising your dignity! The most distinct way to partially resolve this little issue is through a technique called “frosting”. It is implemented in an array of design options in which decorative patterns are chosen before they are cut-to-fit. An adhesive film is then applied to the window. 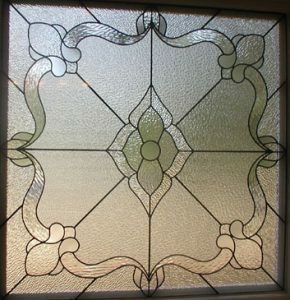 The result is the appearance of expensive, sand-blasted glass. It allows natural light in and blurs the view most satisfactorily. 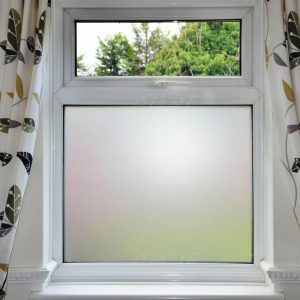 If tweaking the glass is too much trouble, you can rely on the most obvious options. Though not necessarily commonplace in bathrooms, curtains have the advantage of achieving style and privacy with minimal effort. You’ll want one that is easily removed for washing purposes. You don’t want material that will absorb moisture or degrade from it, so you may want to stick with a lightweight fabric that is somewhat water-resistant. Sheer curtains are ideal, durable to the inherent environment, allowing light and maintaining seclusion. 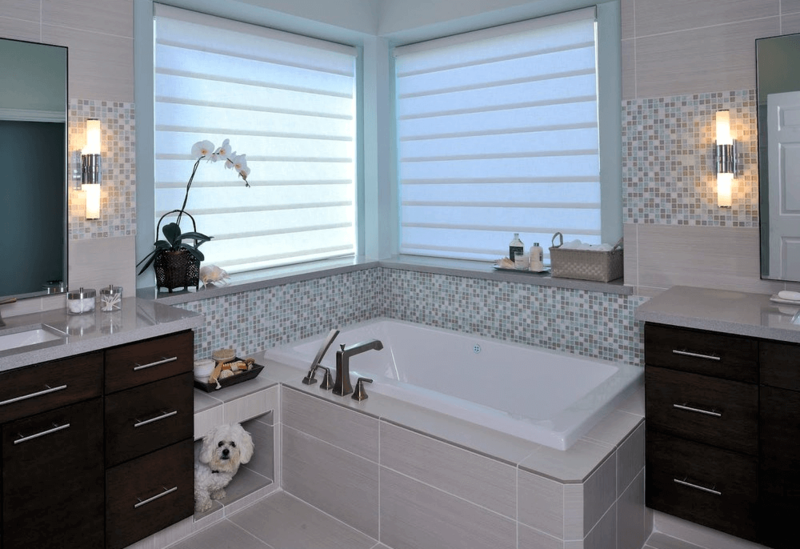 Blinds and shutters are common for use in bathrooms, but in a moist climate they tend to get dirty quickly, and since cleaning them is a bit awkward, they’re not enjoyed by everyone. Bottom-to-top or open-and-shut functionality are the standard options, allowing the personal decision of how much to reveal or suppress. Blinds and curtains allow you to keep your windows open and promote fresh air, but if you’ve neither, the aforementioned textured glass will expose the interior when ajar. This is the disadvantage mentioned earlier. That’s when you should check if your window can open from the top. It’s typically too high to facilitate a look-in and it allows free breeze circulation. It’s comforting isn’t it, to know that other people think about these things? Privacy is a right, and you should never be shy about taking action to ensure it. And when that action is taken properly, no one will even give it a second thought.